Our partner school LTL (Live the Language) in Shanghai is located in the heart of the city. From the school it is less than 300 meters to the Shaanxi South Rd. subway stop, where lines 1, 2 and 12 meet and a mere three minute walk to Shanghai’s main bar and nightlife area. With countless restaurants and shops close by, this is very you really can feel the buzz and rhythm of one of this great city. The school itself however feels more like a “home away from home”, with a comfortable rest area, a big lunch table where students and teachers usually eat together, free WIFI, a big sofa and free coffee and tea all day. While it is easy to meet other students due to the “family atmosphere” during class breaks, staff and teachers are also very involved in the school’s social life and the infamous “mini weekends” on Wednesday nights are just as much fun as the other regular school dinners, weekend trips and city tours. During the week, the most popular activities are school dinners, after school drinks and school karaoke nights. The intensive course has a maximum of six students per class, and an average of 3 students per class, making it a minigroup where each student gets a lot of personal attention. With 20 classes per week, each class lasts 55 minutes and the course teaches both speaking (70% of class time) and reading/writing (30% of class time). All courses are taught by university certified Chinese language teachers. Airport transfer upon arrival at Shanghai airport. Price per person and way. The school is open all year round, it means that students never loose any classes, even if there is a National Holiday during your course. However during holidays it can come to changes in the schedule and classes might be moved to the week or weekend before or after the National Holiday (students will need to follow their teachers class make up schedule). Here are some of the National Holidays 2019 to take into consideration: 01/01/2019 (international New Year), 04/02/2019-10/02/2019 (chinese New Year), 05/04/2019 (Qing Ming Jie), 01/05/2019 (Labor Day), 07/06/2019 (Dragon boat festival), 13/09/2019 (Mid Autumn Festival), 01/10/2019 (National Holiday). For additional € 259 you can book a "survival kit" that includes a transfer on arrival, a pre-charged Chinese SIM card with 500MB 3G internet and 300 minutes of free local calls during your first month, a Chinese bank account, bike hire for the entire stay, public transport card with approx. 15 subway or bus trips & school locker. The combined course consists of the intensive course with 20 lessons per week and 10 additional private lessons per week. Especially if you want to progress as fast as possible, this course is the best option. During the small group classes you follow the regular school curriculum, but the private classes are fully tailored to your needs. When you book an intensive & Tai Chi course, you’ll have 20 lessons of Chinese per week, with 10 lessons Tai Chi. This typical Chinese sport is a good way to cultivate shape, breath, strength, quality and spirit of the human body. So you’ll stay fit during your Chinese language course abroad! When you book an intensive & Kung Fu course, you’ll have 20 lessons of Chinese per week, with 10 lessons Kung Fu. Kung Fu is an umbrella term for all the Chinese material arts which contain various fighting styles. We offer you the possibility to practice this sport during your language course in Shanghai. The intensive & cookery course combines an intensive course of 20 lessons with 10 cooking classes to get to know the Chinese culture and gastronomy even better! 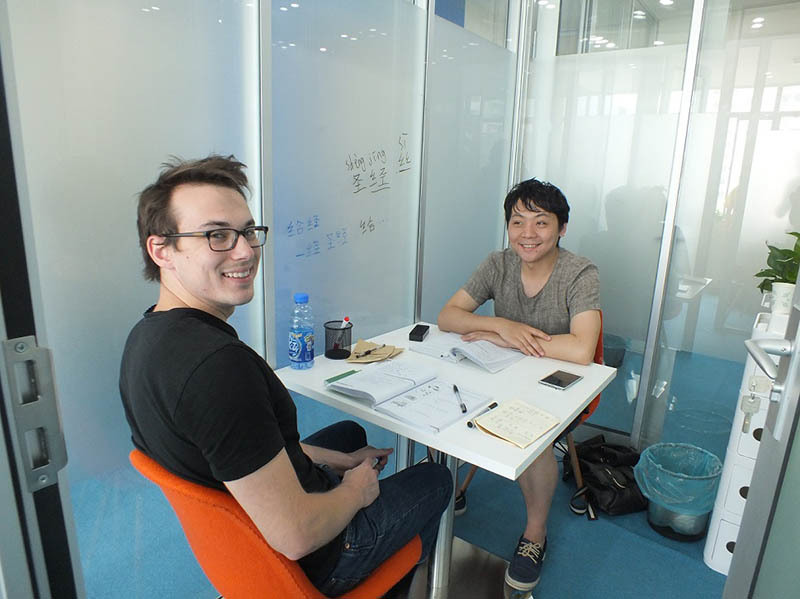 The One-to-one course is a very effective way to learn the Chinese language, as the private lessons can be focused exclusively on your language needs and interests. You can book 20 individual lessons per week or more (if you wish to book more lessons, please contact us). If you are interested in more lessons per week, please contact us. When you take the One-to-one course combined with excursions, you’ll learn Chinese at a different historic location in Shanghai every day (4 hours per day). Transportation costs or entrance tickets are not included. Transport and entrance tickets, if applicable, are not included and are to be paid to the school upon arrival. Most students at LTL choose to live in a host family. To guarantee a real immersion environment, there is always just one student per family which means that you will be fully integrated into a real Chinese home. You will of course have your own private room with all the privacy you need, while you sometimes have your own bathroom but in some families will also have to share it with other family members. The highlight of any Chinese families daily life is dinner and you should be prepared to be pampered with a lot of traditional Chinese food if you book meals (half or full board). Vegetarian, vegan and gluten free options are available and prices already include free WIFI, air-con and all other bills. Shared Apartments are centrally located and usually only about 20 minutes from the school. You will stay in a standard room where you will share a bathroom with your flat mates. The kitchen and living room are always shared and your flat mates will be either students or other young international people who came to China to discover this amazing city. You can also book a Shared Apartment Plus, including a large room with en-suite bathroom. Shared Apartments Plus are exactly the same as the standard shared apartments, but you’ll have a large room with en-suite bathroom. If you would like to enjoy more privacy during your time in Shanghai, staying in a private studio would be the best option. The studio is fully equipped with a private bathtoom and kitchen and is located at approximately 15 minutes by bus to school. You will find many shops and restaurants in the neighborhood. The studios are being cleaned once a week.